Intuition is a gift that all of us receive from birth, like an inner capacity. We can choose to ignore it or listen to it, to neglect it or to feed it. Whatever you give attention grows and increases, so does our intuition. The world we live in now loves to disect knowledge, find the real and objective cause to everything, rationalizing our thinking process so what we proclaim can be prooven. There isn’t much space for us to explore our intuition, to allow ourselves to accept an idea or an experience as being ‘real’ if it can’t be rationally explained, if we can’t make a ‘plan in 10 steps that will lead us to the top while minimalizing the risks’. There isn’t much room for just trusting our guts, because for some unknown reason, we feel that it’s just right for us. But even if we wanted to tap into our intuition, where would we start? And how can we recognize our intuition in our over active mind? Then the dictionnary says “without the need for conscious reasoning”. To me that says it all. There is no need to reason because our intuition knows what’s right for us. It knows what our inner self truly wants. That ‘instinctive inner knowledge’ is there to wake us up, so we don’t end up as frustrated adults living a life that’s everything but deeply fulfilling. Out is the reason and the reasoning, bye bye for now! You’ll come back later when I (and not my convoluted mind) ask you to work effectively to improve the process of reaching our goal without bringing us down. But wait a minute, is it even necessary to listen to our intuition? Can’t our rational mind take the best decisions to guide us in life? The mind has many functions, one of them is there to allow us to decide the best of two options, to rationalize the possibilities according to our preferences, goals, fears and doubts. The mind is crowded with memories of past experiences that still affect us greatly in our daily lives. “Remember that time when I fell trying to do a handstand in front of the whole class? I was so hurt and humiliated… that’s not for me, I’m not going to do that anymore and, anyway, why do I actually need to be able to do a handstand in the first place?” The mind remembers the fall and humiliation, the fear builds up… we rationalize the process deciding that it’s actually not necessary to be able to do a handstand (which is pretty right actually;-) But take that into other experiences, multiply then by hundreds and hundreds of experiences, build the intensity around that process to up to 100%: you’ll end up being guided by your memories, fears and rational mind. You’ll avoid doing many things even though you have that little buzz in your belly and little voice in your mind saying ‘I wish I had the gut to try’. Where is the fun in that, where is the creativity, the ultimate freedom that comes from being totally open to whatever comes? Where do our dreams go then? How do we fulfill oursleves in the long term? Out they go, our dreams, into that dark corner of our mind, locked up in a box with big letters written on it: “danger, do not open, silly ideas”. There we are, by not listenining to our intuition, for multiple ‘objective reasons’. What if instead we learned to control our mind, just a little bit, so we would have more chances to allow new, creative, beautiful feelings and ideas to flow in? Intuition comes from a source that’s more profound than our mind, even though its messages are received and interpreted by the subconscious mind and translated by the conscious mind. We can then consider that our intuition is a function of the soul’s consciousness. Our intuition (our soul) is trapped between the body and its instincts (flight or fight mode) and our mind (our intelligence). There is nothing wrong with our body and mind really, it’s just that they take too much space. It’d be nice if they could back off a little to share the space with our intution and soul so they can all work together as a team and not as ‘who’s the boss?’. How lovely would that be, to have a fine balance between what our gut feelings say, what our intelligence adds to that and what our tamed mind enlightens so we can become wiser, taking decisions that are right for us, that allow us to dream, create and soar into the infinite possibilities that this very life offers. I want that… I want to be able to understand that little voice that comes from within and says “Cendrine, don’t play small, dream bigger, there is so much awaiting for you out there in the world. Drop the whys and hows, the fears and the doubts and just go for it!”. I have started to tap into that for a little while now. I meditate, as much as possible, I practice yoga, I surround myslef with inspiring people and I create space in my life so I can listen, as much as possible, to my own intuition… I do it more and more and I can see what it does to me: it brings more joy and happiness in my life. It brings as well doubts, fears and sometimes chaos… but I am still learning to recognize that it’s not because of my intuition that I feel chaos or dramas in my life, it’s because of the deep knowledge that my intuition is so right that the rest of me has to somehow transform, adapt and grow. My intuition is just there to help my soul soar, the rest are just turbulent winds trying to brake the calmness of the soul-lake. Sometimes, as one (body, mind and soul) I can work with everything that I have to become a brighter version of myself. I want to inspire and be inspired, I want to look back in 50 years and have no regrets. I want to listen even if it scares me. The fear will eventually leave me, not the inner voice, it’s its right to be deep within me, not the fear. I decide who stays and who goes! I want to help others tap into that ability; because being able to listen to your intution will bring you endless rewards, the biggest being to find freedom in your heart so you too, will have no regrets. My intuition guides me through difficult times, it is my best friend. What about you? How is your intuition? Do you know where it comes from, how it manifests? Can you make the difference between your gut feelings and the chit-chat in your mind? Are you able to fully embrace your intuition so it can guide you through life, feeling free and happy? If you’d like to learn more about techniques that will allow you to tap into your intution while having a great time in a beautiful studio, come and join me for Novembre’s workshop at Beginner’s yogi! We’ll work on discovering the different types of intuition, on meditating to calm the mind an open our intuitive centres and we’ll relax through a guided visualization that will lead you into your inner temple, where you’ll have all the time and space necessary to discover what your intuition wants to tell you. This entry was posted in General on November 2, 2015 by cendrine. Pressure is very high on our shoulders nowadays, we have to perform in so many areas that feeling overwhelmed is getting pretty common. So every now and then, maybe often, we snap. It could be through endless crises of tears-for-no-reason, through burst of anger, through eating way too much chocolate, to drinking until we pass out, without forgetting the downs that want to keep us snug in bed, feeling sorry for our life. Then we think: “what’s wrong with me”? We can look for many explanations and find the reason why. Not always though… sometimes the reason seems to be eluded by so many layers of other mixed up emotions, traumas, fears and so on that it looks pretty impossible to find a reason to us feeling that bad. What I have shared here is something very personal that has happened a couple of times in the past… It was violent, destructive on our family and long to recover from on my side of things. The guilt that would follow was overwhelming. So I thought: that’s enough, there is something more to this that I can’t see yet but that’s triggering the whole thing… and I could feel that it was coming from way back… so let’s find out. After many meditations and a couple of consultations with a friend, I found out about a couple of past lives that had been so hard on me that they had created some thoughts and actions patterns on my subconscious level. Every time I was put in a similar situation, my previous experiences influenced very strongly those reactions… making them looking totally irrational for the present situation. It was a huge revelation and liberation for me… I knew that there was nothing wrong with me!!! I took that from the past, having kept this patterns as a protection. I realized that it could be acknowledged then released. So I did release all those past experiences and none of this has never happened again! I won’t get into too many details but I have found out so much more about me that I have been able to deal with some friends and family members way better than before, that my relationship with my husband is keeping on improving, that I can finally start to move on with my life without feeling handicapped by what I use to think was a ‘strong and bad temper’. It is all through deep introspection through my meditation practice, as well communication with my spirit guides and through some help that I have received from spiritual healers. The journey begins… but it never ends. How exciting is it to discover that I have the power to change, to become who I truly am, to free myself from the bondages that once hold me back? And it’s not just me… it’s all of us out here, in this crazy yet so beautiful human world. To finish, I would like to encourage you, with love and passion, to trust your own journey; to trust that whatever comes up is good for you, because it helps you get to know yourself better. Don’t be afraid to peel all the layers of yourself, what you will find will amaze you: only pure beauty and love resides within! Saying that, many of us have issues that are so engrained and dangerous for ourselves that it is indeed better to find help from a professional: doctors, psychologist, psychiatrist, etc as well have their own gifts and knowledge to help us, so never hesitate to ask for help! You know were to find me for a spiritual consultation! This entry was posted in General on April 13, 2015 by cendrine. This post is inspired by my recent participation at the Wanderlust Festival in Taupo. Big gathering for yogis, I had the chance to meet many internationally recognized teachers, mentors and musicians. I could talk for hours about each one of them and their teachings. They all had an amazing experience in their field and were able to share their great knowledge to all of us who were there. On our way back home, me and my friends talked the entire way about our own experiences and views of the Festival. You can imagine 4 girls in a car for more than 4 hours talking non-stop: pretty intense! Yet, our conversations quickly evolved around the vibe we felt at the Festival. It wasn’t so much the knowledge shared or concert that rocked the place but more the energy of all the people who were present. From the speakers, to the teachers, from the student to the vendors of food, from the people selling their art to the volunteers helping around, every single person seemed happy. The happiness was just so present that I am still smiling;-) It was obvious to us that the speakers and teachers absolutely loved what they were doing, that the Indian lady was just so happy to sell the food she made to people who were loving it, that the volunteers loved helping around people, that the students were very happy to have so many things to choose from, all of them of great quality. So what I would like to finish with is a strong encouragement to all of you, who just like me and like everyone else on this earth wants to be happy: find what makes you vibrate and spend time doing it, because that will give you energy, that’s your fuel… It doesn’t mean leaving everything behind just like that but more finding what’s good for you and what you love and then do it. It can be a pass-time that will provide enough happiness into your life to carry on other duties with more ease; or changing road completely to spend all your time doing what you love. Don’t let fear hold you: fear is not necessary and only blocks the flow of life (except if a bear is running towards you which is very unlikely here;-). In any case, you will be surprised at how easy that is… I mean how easy things flow when you spend your energy doing what you love. If you have no clue about what’s good for you and what makes you vibrate with joy, start meditation, it’s a fantastic way to know yourself! This entry was posted in General on February 3, 2015 by cendrine. Have you had a headache recently? Chances are high that you had one in the last couple of months, most people suffering from headaches at least once a year. I have, very often, and it wasn’t nice at all. In fact I have had headaches for as long as I can remember (well, they started when I was a teenager really). I have done many researched and talked to many people about it but there is something obvious that doesn’t really help much: they are many different causes to headaches and everyone is different so it is very hard to isolate ‘the’ cause of a headache. Actually, it is often an addition of causes that will lead to a headache. For example I have tight muscles in my neck, if I have a bit too much wine one evening, forget about drinking water and don’t sleep much that’s it, the day after I am 100% sure to have a very bad headache. Or sometimes I just feel that I slept in a funny position, my neck probably crooked, then I get angry and stressed for some stupid reason and that’s it, an hour later my head is pounding and I am desperately looking for the last two tablets of paracetamol that I spotted in the mess of my hand bag two days ago. And it goes on like that: tight muscles, food and drinks, emotions are all triggers to headaches. So think about yourself; when do you have a headache? Can you find the source of it? Maybe it would be a good idea to keep a journal of what you eat and drink, your daily activities and your moods to be able to pin point where your headache came from. It can be life changing, I tell you! 1. Get hands on: Typically when a headache starts I just want to lie down, stay in the dark and do nothing, especially move, as I wait for the pain relief to kick in. For the last couple of months I have tried a different technique that has proofed to work pretty well: I massage myself. I interlace my fingers and use both my thumb to massage the base of my skull. Having the hands interlaced allow me to exercise pressure at the base of neck and massage my whole neck without actually using much strength. I push at the base of the skull, where I can feel the little cavity where my thumbs will naturally fall. Then I go down then spine pulling the muscles away from it. I do it a couple of times. Then I massage the base of my skull up to my ears. It’s heaven and finding those knots help me trust that I really need a good massage. Then I massage my skull, especially where it hurts: by rubbing gently I move the skin and give the body the message to bring more blood in there, therefore helping the muscles to relax. I rub, scratch push and pull; it works wonderfully to bring movement and help the blood circulate more freely, hence reducing the pain. It’s good to do it as soon as you feel the first symptoms of a starting headache otherwise it will just be too painful to even think about it. 2. I book an appointment to have a proper 1 hour massage on my head, neck and upper back; because nothing can replace a good deep work that’s going to keep me going for weeks without even having to think about my headaches. Most headaches originate in tight muscles in the neck so if you get those relaxed, you are pretty good to go pain free for a while. Beside, with smartphones and computers, we bow our head a lot more than we are supposed to, bringing it out of alignment. Therefore it is not properly supported by the spine as it should and the muscles have to work a lot more to hold the head in place. The poor guys are doing extra work that they are not supposed to do and we need to realize that. 3. So knowing that my body and especially my neck are under so much pressure, I help them by regularly stretching them… patiently! I use one of my hand on the opposite hear to intensify the stretch and point the opposite hand towards the floor too to create a nice stretch. Then I play with the angle of my chin to target different muscle groups. And I do it very slowly! I use both my hands on my head to bring it forward and feel a good stretch. Then I remember to roll my shoulders too. 4. I practice yoga. It is the best way to know your body and correct your posture. I could write for hours on why we are in such bad shapes nowadays and why practicing yoga is very important but I’ll make it short: practice yoga, find a teacher you like and give your body the workout it needs. You look after your car, look after your body even better: regular exercise and check ups. Headaches can start from tight upper and middle back as well so getting those stretches and working as they should will greatly help you overcome your headaches. 5. I drink plenty of fluid, water actually as juice is just full of sugar and really not necessary. I don’t even mention fizzy drinks as you certainly already know how bad they are. 2 liters of water a day is a minimum really and most headaches start with dehydration. Instead of having one full glass of water I have two in a row, then I’m sure that I’m good for the next 30 min. 6. I take magnesium supplement every day. I often say it to my clients: magnesium is the muscles’ best friend. It helps them to relax, then it helps headaches too as it will help to relax the neck muscles. It is as well helping with stress, anxiety and sleeping problems, all that are related to headaches. A must really! 7. Practice meditation and mindfulness. I then don’t lose the plot (that often;-) and can get my stress and anger issues under control. I am happier, more settle and think more clearly. Meditation transforms my life in many ways, reducing my headaches being one of them. Feel free to check my online shop to give it a try. 8. I stay informed. I like to know about food that can trigger headaches. After seeing a kinesiologist last year we found out that I had a built of toxins in my body that where leading to brain fog and headaches. The ‘food’ being: acidity regulators, bad salt, food coloring and preservatives. No need to say that eating processed food over 30 years as damaged my body obliging me to switch to an organic healthy diet. Since eating organic food that I cook at home the old fashion way I have drastically reduce my brain fog and headaches. I am honestly in shock with today’s way of eating and becoming a big defender of eating organic. Because this is how nature intended to be and it helps the local kiwi economy too. So get informed, find out about what you put in your body, then make up your mind about what’s good for you and what’s not. – Peppermint oil at the base of your nostrils and on your forehead: instant relief that work! Again, use an organic one! I really hope that by reading his article you’ll get a few more ideas about ways that you can deal with your headaches. One last word: You are in control of your body and your mind, no one else. So you do have some power over what happens to you. Try to get better yourself but if nothing works then consult someone, a doctor, a physio, a massage therapist, a kinesiologist or a chiropractor. If you need references I have some so don’t hesitate to ask me! Thank you very much for reading me, I wish you all the best in your recovery! This entry was posted in General on December 2, 2014 by cendrine. I have had a couple of people asking about the spiritual consultation I offer. I sounds enigmatic, a bit weird and maybe scary too. Many of you would probably think that’s not for them at all as they don’t believe in spirits and can’t feel any ‘energies’ anyway… and it’s fine! I totally get it, all that ‘world’ of spiritual awakening, talks with spirits guides and energy healing is totally impossible to comprehend on a rational level. Nothing can be proven, most people don’t see anything, and feeling the energetic body is not really a big deal… Most of all, being seen as weird by others when thinking about all this is often all it takes to be put off. We don’t learn those sort of things at school, nor do we learn them from our parents (for most people)… no one really talks about it in public, to friends or family members, too worried of being seen as ‘the weirdo’… Since a young age, we learn to name the things that surround us, we learn good manners, we learn to behave and response to society standards the best possible way. We go to school, for so many years that all our life is spend learning things that come from the outside. Who has learned that deep breathing calms the mind, that sitting in nature regularly gives more energy, refreshes the mind and who has learned to cultivate the habit to listen to their gut feeling, their intuition and not their thinking mind? Who has learned that by calming the mind, you can access pretty much every information that you need about yourself, the people and the world surrounding you? That you then get more creative, happier and then nicer to yourself and people surrounding you? Not many of us right? It is just not how society is designed… That knowledge about ourselves, our soul, our intuition is nearly completely neglected by most people. Then comes a time when life starts feeling weird, we feel unhappy, unfulfilled, sometime right crazy and always over-thinking every little things that happen into our lives. When we grow older, the question ‘Is that it?’ resurfaces… and our thinking mind find 100 thousands reasons to justify our existence from a rational point of view. But the little voice is there, the boiling feeling inside starts to make us erupt like a volcano, scaring ourselves and our loved-ones, or we get pretty depressed for no obvious reasons. This is why I am doing this treatment now. To help people see that we are not just a body and a mind constantly over-thinking. That the pain we experience in our body and the emotions that submerge us are not there for no reason… no, they don’t come out of nowhere… The soul thrives on happiness, on self-love, on peace. It wants to be heard, it wants to blossom. But they are so many layers wrapped around it that it doesn’t have a voice anymore, it can’t be heard, it is not allowed too, and it is constantly judged and pushed aside. You see, when listening to your intuition, to your soul, you open a door to life-changing experiences. You learn to know yourself and to accept what is going on into your life. You then take the reins of your journey. You then start, not to over-think, but to feel what you have to do to be happy. There is nothing more amazing that discovering who we are, than finding out all the things we are capable of. And there is a wonderful way to do it… by connecting to yourself and to other people that are on the same journey. Like I have met many people offering all sorts of help on spiritual matter, I have always known that me too, one day, I would be offering spiritual consultation. It’s part of my journey. Since a very young age, I have heard spirits, good and bad, I have seen things, like visions, of events that happened in the past or that would manifest later. I have pushed them aside and ignore them… was it the reality? It was so scary… no one was there to help me out… But as the years passed, it became stronger, I met more people, learned new things, learned to use my gifts that have then been able to grow. I can connect to spirits now, on a daily basis. It can see and hear spirit guides or passed loved ones. I am a clairvoyant too, so I can see images from this life or from past-lives. I can channel spirit guides as well, which is truly fascinating and always fun to do. Basically I then tell you what your spirits guides want you to know. I feel the energy field in other people, where blockages are. If I need help on something, I have my pendulum and spirit guides to help me out. I do all my ‘weird’ things with great joy and it always surprises me to see the results on people afterwards. What a difference in their energy! And off course: I am not a doctor, so this is NO replacement for medical attention. If you have any serious health problems you should really see a specialist. This treatment might help but it doesn’t replace a visit to professionals! This entry was posted in General on November 4, 2014 by cendrine. Meditation is now widely recognized for its many benefits, yet it is still something a bit daunting and estranged for most people. “Where should I start, what is it exactly, I don’t really have time for this etc” are what I hear most of the time when I talk about meditation. In the following lines I hope you’ll find some information that we’ll make you want to try it out by yourself, because yes: Everyone can do it and – No, you don’t need to spend that much time doing it to ripe the benefits of it! – Think about how many things you do in the hope of attaining a condition of rest? Does it bring you inner peace? – Peace can never be found outside ourselves because the process of pursuing never ends. – Since we are born, the learning process has flowed outward the body by the five senses. We have had to constantly learn about what we can and can’t do in our society, all the rules, regulations, manners etc. But most of us haven’t learned to relax, connect and meditate. 2. How to bring meditation into my daily life? – As you make priority for certain things, taking time to relax and meditate every day is essential. You have to make relaxation/meditation an activity like taking a shower; writing emails or go on Facebook! – Meditation can be found anywhere at any time, not only sitting every now and then. The whole point is to focus your mind on doing only one thing at a time. – Meditation begins once the thoughts and emotions have been stilled. It is any activity and practice of which the goal is super conscious awareness (=a high level of awareness). 3. How much should I meditate? – The more regularly you meditate and the more deeply you meditate, the sooner you’ll find yourself acting always from a centre of inner peace. – I like to compare the brain to a muscle, the more you work on it, the stronger it gets. It is like that for meditation, for calming thoughts and finds inner peace. Again, consistency is the key. But be kind and gentle to yourself as well; don’t beat yourself up if you don’t meditate. Find that strength inside you that pushes you to do the right thing for your own good, listen to yourself! 4. How do I have to meditate – what are the clues for a good meditation practice? – To meditate, you need to have the right mental attitude which is the one of listening. Most people don’t really listen, they are in a battle to win arguments and they campaign continuously for their own ideas. You have to give that process a rest! – The thoughts are usually rushing into the mind like untamed horses in the wild. You can’t really control them and that process is exhausting. So, how can I calm my thoughts? The clue is not to get caught in them. You have to look at them as if they were clouds in the sky, just passing by. Don’t analyse them. Just recognize them and let them go. – The best posture to meditate is sitting up with a straight back. You should try to have a good posture that you can keep form some time without moving. In yoga nidra we lie down. It is different from meditation and could be considered as a good preparation for meditation as it quietens the mind. – When you are ready to start, begin your practice with conscious breathing. Take 12 deep breaths to relax the body and the mind completely. – You can focus on your heart and visualize a pure white light shining outwards in ray of love and harmony to the world around you. 5. I find it very hard to calm down my mind, what should I do? – During periods of restless mind, when the thoughts run wild, don’t criticize yourself and “punish” you. Try relaxing first (with deep breathing or yoga nidra) and maybe meditate for 5 minutes. If it doesn’t work, don’t blame yourself. Water your thoughts with love and gratitude. Love yourself! And try again later during the day or the next day. – Find some meditation that you can listen too, it will help you stay focused. Some guided meditations bring you to your inner temple and help you find your intuition. – Start with short meditation (5 or 10 min) and then extend the practice by 5 minutes at a time. Be consistent! – Remind yourself WHY you want to meditate: find calmness, deep true happiness, deal with everyday life better, etc… It will help you find the strength you need to stay consistent. Meditation should be a joy, make you happy! 6. What are the benefits of meditation? – Meditate will bring you a calmness of mind that is precious for your health and inner being. – In our busy world when people ‘burn out’ all out more quickly than before, meditation allows you to take things more slowly, give you that break that your body and mind so much need. – A clear and present mind is extremely productive and helps you make the right decisions (based on the heart and not the conflicting and constant flow of the of the mind). – The calmness born of deep meditation represents a higher degree of awareness. That calmness will enable you not only to remain calm during periods of intense activity but also to face and accept with wise understanding the trials of life. Your constant goal should be to stay actively calm and calm with activity. 7. What is the difference between relaxation, meditation and yoga nidra? – The term ‘relaxation’ can be achieved through activities like listening to music or walking in nature, or simply having a quiet time. Relaxation is something we do naturally, and we don’t need any special training or techniques. – Deep relaxation is something very different. It quietens your mind and releases physical tension in your body. In a state of deep relaxation, your heart beat and breathing slow down, and your body and mind become deeply calm. There are many techniques to help you relax deeply, including the practice of yoga nidra, or ‘psychic sleep’. You may find that you become so relaxed that you fall asleep during the practice. This is fine, the aim of yoga nidra is to ‘surf the interface between sleeping and waking consciousness’. Usually your guide’s voice will bring you back to a semi-conscious state. – Meditation is the practice of training the mind to realize some benefits or as an end in itself. In general, it refers to a broad variety of practice such as techniques that promote relaxation, bring internal compassion, increase the energy, clear any stress etc… A certain form of meditation which is more intense aims at effortlessly sustaining a single-pointed concentration meant to enable the practitioner to enjoy an indestructible sense of wellbeing while engaging in any activity. This entry was posted in General on October 17, 2014 by cendrine. I can’t believe it’s already been two month and a half since I injured my finger… It was on the first of July which is my mum’s birthday, what a not-so-nice day to cut my tendon! Not that any day would have make it nicer really! Going to Belgium for a month was perfect timing. As I couldn’t drive or cook, I would have gone crazy staying at home and my husband would have being exhausted to do-it-all. Whereas, on holiday, I just literally put my feet up and indulge in being served by my mum and learned to accept my mum-in-law’s urge to cut my meat even though I insisted on doing it! I guess they were happy to help that much as they don’t get a chance to do it that often. I had time to do my exercises while having a delicious patisserie with my friends or while sunbathing by the swimming pool, watching the kids going crazy with their cousins. I had time to think and rethink my life, make some new projects, dream about the future. And, patience not being my number one quality, I had to learn… a lot! I learned about patience and I learned about loving my hand, my body even though just the sight of it brought tears to my eyes. I thought about all my clients that I have seen recover from injuries, trying to get through the pain with a smile on their face. I admire all of you, going through pain, going through recovery, more than ever. I have had to apply what I preach: patience, love for myself and discipline in my exercises. I still have to do a lot of exercises, massages on my finger, stretches etc… I still can’t go to yoga, which is a very big deal for me; neither massage… BUT, time is flying and it keeps on improving!!! My hand specialist is very proud of me and so is the acupuncturist I have been seeing. According to them, I will have the green light for everything I want to do at the beginning of October!!! I can’t wait to re-open Sublimity, see everyone again and create the life I want! This entry was posted in General on September 8, 2014 by cendrine. We all know that constant chit-chat in our head; we think about what we’ll have to do during the day, or tomorrow or in a month. Then we think about what happened yesterday, about that terrible guy who was so rude with us, about the disgusting food that we ate at the restaurant, about this and that… We think then that we need a holiday, that life isn’t fair, that the world seems to be against us most of the time. ‘I just so need a break right now’. We think – think – think. The process of over-thinking is often unrecognised as being a nuisance in itself. It only becomes clear when we start having trouble sleeping or when we get so stressed that we can hardly eat or when we get into petty fights for no reasons. What if most of our troubles were coming from that buzzing mind? We could then take the reins of our own lives and start to actually control it instead of feeling overwhelmed most of the time. It sounds good doesn’t it? Being free of worries, living in the present moment, enjoying life’s simple things like the birds singing and the wind blowing in the trees. I know, it sounds hippish. I know, you then think: how’s that even possible? I am not the type of person who could sit for an hour to meditate, that’s just too boring and I haven’t got the time anyway. Practising mindfulness helps the stress level to drop drastically. People feel less anxious, depression and anger drop as well and become more manageable. It increases concentration, memory; heightens compassion and boosts the immune system. It helps sleep better and ease tensions, it helps with feeling happier in general! If you are vulnerable to depression, mindfulness could also help keep those demons at bay. What’s amazing with practising mindfulness it’s that it is very effective to raise self-awareness. You literally learn to know yourself. Then, when one of these gloomy moment appears, you can catch it and through it away. You know what’s good for you and you just stay with it. 1. Try sitting quietly in a busy place and watching the interaction between people. Remember not to judge or have any opinions. Just watch. 2. Take ten mindful breaths in and out, calming the body and mind, rest and notice everything that is going on around you. 3. Use an everyday environmental cue (such as an alarm on your phone) as a reminder to pause and breathe. I find that eating with mindfulness is extremely important. Watch what you eat, chew well, taste your food, enjoy it in the company of others or alone. Don’t watch TV, have stressful talks at the dinner table, switch your phone off and focus on what you are doing. Not only will your food taste better, but you’ll feel full faster and you will digest better, then avoiding gas or bloating. The nutrients of the food get absorb better as well, so you’ll end up being healthier and happier! This entry was posted in General on March 19, 2014 by cendrine. You can feel it and I can feel it when I massage you; that little – or big – knot that’s painful to touch but needs to be worked on to relax. When coming for a massage, most people know they are tight and most people are yet surprised to see how many knots they have; they are very often a lot more than they were expecting! So we know they are painful and we want to get rid of them – or at least we don’t want them to hurt that bad. But then, what is that thing exactly? A muscle knot is actually a myofascial trigger point. When you want to use a muscle to do a movement, your brain sends a message to the muscle for it to act in a certain way, to contract and relax. When the muscle stays contracted without receiving any messages, it is going to create a knot in a specific area of the muscle. That happens for many reasons: injury, sedentary life style, overuse or stress. The muscle is just going to stay ‘stuck’. The knot is just a little part of the muscle in itself and specialists have found out that they are some patterns in where the knots form. Because the muscle remains flexed and refuse to relax, it creates pain. TrPs can be “active” or inactive.” Have you ever felt very achy when you’re sick with a cold or flu? Much of this ache can be contributed to inactive (latent) knots that are being woken up or activated by the cold. 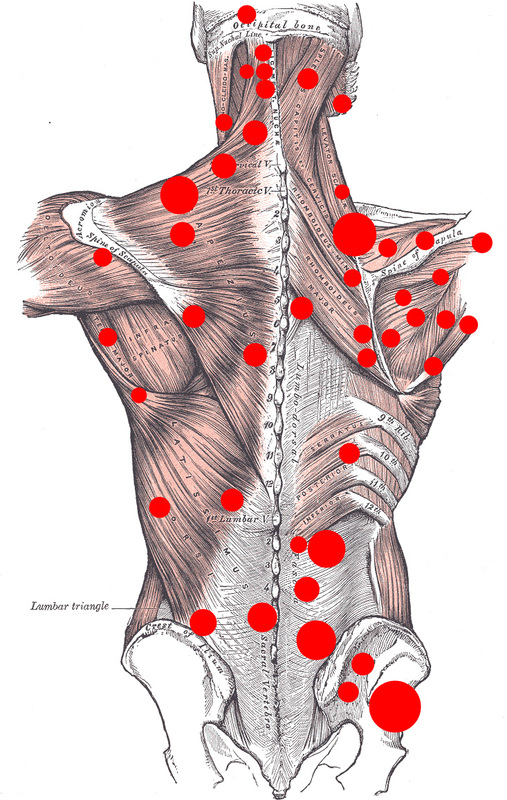 If they are active they are usually shooting (referring) pain all over the place. If they are in your shoulders, neck, head, or jaw you can get a tension headache. If you have one in your rotator cuff it can make your forearm hurt. There are even knots that can develop in your neck muscles that can make your ear ring, your eye water, or even give you a toothache! If the referral pain touches another knot it can activate it, or if it is chronic enough you can develop MORE knots within the referral pattern of the original knot. The good news is these referral patterns are not at all random. They follow very specific routes through the body which are so consistent we have developed “Trigger Point Charts.” The darker areas are the most common referral patterns, the lighter areas a little less common. What can you do to remove your knots? Thinking that exercising, like running, after a day at work is going to help is wrong and can actually make the whole thing worst. Your muscles have behaved abnormally all day by sitting at a desk and all of a sudden they should work 100%. Bad bad bad for your body! That’s when stretching – I mean real long and good stretches – start being so crucial if you want to help your body prepare for that run. Stretch and start walking for example, before going for the full run. During the day, take frequent breaks while at work to walk around and get some fresh water. It’s going to keep your muscles hydrated and working a bit. If you start experiencing pain during your exercise, it is the sign that you must stop, your muscle is too weak to perform the movement, so never ‘push through’ the pain or you are really going to injure yourself. Take regular bath with Epsom Salt. Epsom Salt contains magnesium, which is quickly absorbed through the skin and goes directly in the blood system and hence your muscles. Your muscles relax quickly and effectively that way. Stretch every day but be careful: if you pull hard to touch your toes and hunch over your are going to injure your lower back; always bend your knees if you want to stretch your back. If you want to stretch your legs, do so while lying on your back, it’s going to prevent you from getting injured. This entry was posted in General on January 31, 2014 by cendrine. Having a massage is great right? So just think about receiving a massage with a little extra that will make your experience just even better! Aromatherapy massage is a style of massage that is becoming more and more popular, and for a good reason: the benefits are numerous on all physical, emotional and spiritual levels but they are just starting to unfold; as much more is yet to be discovered on how essential oil really work. So lets talk a bit more about what it really is. An aromatherapy massage is most likely to be a relaxation massage. The therapist will choose, with you, some essential oils that respond the best to the feeling you want to experience or the pain or bad feeling you want to get rid off. The essential oils are added to a carrier oil which is generally made of nuts or seeds, such as wheat germ oil, avocado oil or grape seed oil. Knowing that, it is extremely important to let your therapist know about your allergies! The mix can be warmed up to enhance the feeling of relaxation. The oils can be used in a burner too or put onto hot towels that will be applied on the body after the massage. But the smell coming from the oil used for the massage is generally enough to get into your system and works its magic! How does the aromatherapy massage work? The nostrils are attached to a part of the brain called the limbic system. The limbic system controls emotions and influences the nervous system and hormones. As the skin is the biggest organ in the human body and because everything that penetrates the skin is not filtered by the liver, essential oils penetrate the skin and get directly into the blood system and therefore the whole body. It is therefore extremely important to use organic products only as you really don’t want those nasty chemicals get into your system. Very often, therapists will use already prepared blend of essential oils. They have been made to bring a certain feeling to the patient and to complete each other perfectly. What is used during an aromatherapy massage at Sublimity? Anyway, just to say that I am a strongly believer in the many benefits of essential oils. So I really had to offer aromatherapy massage to my clients but first I needed to find the perfect blend (it is a lot cheaper and easier when starting a business) and I have! Joy Blend is uplifting to the mood, helping to awaken the spirit, instil positivity, and promote emotional well-being. Sensual Blend is wonderfully fragrant and aromatic. It is uplifting to the spirits, yet intimate and calming at the same time. Unwind Blend helps to calm and relax the senses, and create an atmosphere of tranquillity and peace. Vitality Blend helps restore mental clarity. Uplifting and rejuvenating, it also helps to boost confidence. When you arrive for your treatment, we will have a quick chat on what you expect from your aromatherapy massage. You will then smell all five blends and you will decide which one you prefer. I strongly believe that smell guides you towards what’s better for you. But saying so, I had a client who wanted to relax but was very congested. So I recommended using the ‘Breath’ blend which was not her first choice. After the massage, her nose was clear and she felt as if her body had had a deep cleanse, she was healed! During the massage, I use hot towels with one drop of the blend on them. I use the towels on the body part that has just been massage to bring even more relaxation and leave your body clean and refreshed. At the end of the massage I apply a hot towel on the face which is just pure bliss. After the massage you will have to come back to earth but you will feel just amazing, I promise! If you have any more questions, please let me know, otherwise come and spoil yourself by booking an aromatherapy massage now! This entry was posted in General on January 3, 2014 by cendrine.